Grodzinski, John R.. "Battle of Tippecanoe". The Canadian Encyclopedia, 03 November 2017, Historica Canada. https://www.thecanadianencyclopedia.ca/en/article/battle-of-tippecanoe. Accessed 20 April 2019. The Old Northwest, incorporating the region north of the Ohio River and east of the Mississippi, witnessed several wars between the US and Aboriginal groups beginning in 1785. The Battle of Tippecanoe, on 7 November 1811, was an American victory over First Nations during Tecumseh's War in the War of 1812. The Old Northwest, incorporating the region north of the Ohio River and east of the Mississippi, witnessed several wars between the US and Aboriginal groups beginning in 1785. 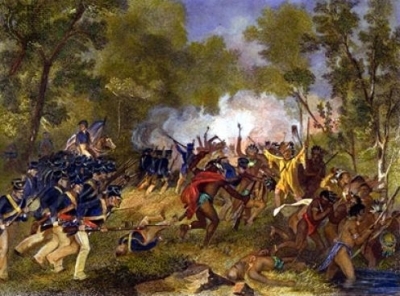 American complaints that the British aided the Aboriginals in resisting American settlement of the Old Northwest have been cited as one of the causes of the War of 1812. Tecumseh's War began in 1811 as a result of the aspirations of the Shawnee leader Tecumseh and his brother Tenskwatawa (also known as the Prophet), to create a First Nations confederacy. In 1808, they established the village of Prophetstown on the Tippecanoe River in the Indiana Territory, which they hoped would become the centre of the confederacy. They then went about promoting their vision, which brought them in direct conflict with William Henry Harrison, the governor of the Indiana Territory. The struggle Tecumseh and his brother led against the Americans continued into the War of 1812. Following several confrontations between Tecumseh's warriors and the Americans, secretary of war William Eustace authorized Harrison to confront the warriors at Prophetstown. Harrison marched from Vincennes, Indiana, in September 1811, with 400 officers and men from the 4th US Infantry, a company of the 7th Infantry, 500 Indiana militiamen and 120 Kentucky militiamen. About 200 of these men were mounted. They reached their destination on 6 November 1811 and established a camp two km from Prophetstown. Tecumseh was not present at the time and Tenskwatawa and his war chiefs decided not to attack the Americans until the following day. Their numbers were probably half those of the Americans. The warriors commenced their attack at dawn on the 7th, driving in a portion of the American barricades. The fighting intensified and following a series of American counterattacks, the First Nations troops withdrew. The battle had lasted about three hours. The Americans suffered 200 casualties, of which 60 were killed, while the First Nations lost 50 warriors and upwards of 80 wounded. Tenskwatawa and his people abandoned their village, which Harrison then destroyed on 8 November. His men also destroyed most of their own stores to free up transport to carry their wounded home. Harrison proclaimed a great victory, which significantly enhanced his reputation, although the evidence does not support this claim. Tenskwatawa's supporters rebuilt their village, which Harrison again destroyed on 19 November 1812. Tecumseh was killed by Harrison's troops during the Battle of the Thames on 5 October 1813. While a clause of the Treaty of Ghent sought to protect Aboriginal rights, the Americans chose to ignore it and any hopes for an Aboriginal homeland in the northwest were ended in 1815.